Coupon must be used at time of checkout to receive discount. *SORRY, NOT VALID ON ONLINE ORDERS, GUN SALES, JEWERLRY SALES OR SALE ITEMS. WE ARE BREVARDS LARGEST FAMILY OWNED PAWN SHOP WITH MULTIPLE LOCATIONS. WE OFFER THE VERY BEST SERVICE AND SELECTION.WE HAVE BEEN IN BUSINESS FOR OVER 21 YEARS AND APPRECIATE ALL OUR LOYAL AND NEW CUSTOMERS. 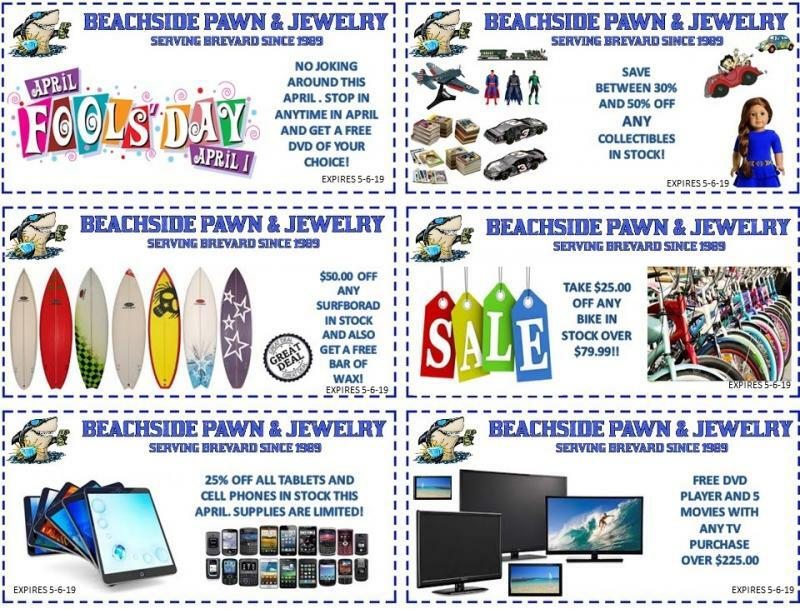 BEACHSIDE PAWN OFFERS THE BEST VALUE!!!!! TOP DOLLAR ON ALL TRADES!!!!! WE OFFER FREE LAYAWAY!!!!! SHOP WITH US AND SAVE!!!! !